A couple of years have passed since Barbara and I visited our siblings in the Chicagoland area. We both moved to Northern California years ago to escape the arctic snows of winter, muggy swelter of summer, and the city's crush of indifferent strangers. We could not comprehend why they had not done the same. As we were leaving my brother George's house for the airport, my niece Susan announced "I'd like to come out and go backpacking with you and Barbara sometime." "Fine," I replied, a little confused. Susan's not exactly an outdoors girl. She's enrolled in the Music Conservatory at Lawrence University in Appleton, Wisconsin. Although I strummed a guitar a bit when in college forty years ago, I believe my brother and I are more or less tone deaf. My relationship with Susan has been cordial, but not intimate. I hadn't really believed she was paying attention when I would occasionally sing the splendors of backpacking in the high country. I was flattered that she might actually wish to spend a little time with her stodgy old uncle when she could be, well, doing whatever it is that young people do nowadays. "Good idea," I said, not believing it would ever come to pass. "Let's do it." But in the late summer of 2003 it actually happened. Barbara and I drove to the Arcata Airport to pick up Susan. She was flying in from Portland and arrived all bright-eyed and bushy-tailed. We retrieved her bag from the carrousel and headed for Eureka, filling each other in on a torrent of detail about our divergent lives. En route, during a pause in the bright flower of reunion, I brought up the subject of time, and the bloom wilted. We had to make a choice, I pointed out, to either go backpacking or dilly-dally around. If we were going backpacking--as I thought we ought inasmuch as that was the premise of the entire visitation--then we were on a tight schedule. Three-and-a-half days was not a lot of time to pack up, drive to the trailhead, hike in, camp for three nights, hike out, and drive home in time for Susan to catch her flight home on Monday. And three nights on the ground were the absolute minimum if our young apprentice was to begin to perceive what backpacking was about, and why we bother doing it. What we needed was a Task Master. I volunteered myself for the job. Caught off guard, Barbara and Susan were too flustered to object, and the nominations were permanently closed. We stopped for dinner at Applebee's in Eureka and discussed all the things we would not have time to do. No hike through Redwood Park in Arcata. No drive through the Avenue of the Giants. No boating on the bay. No shopping in Old Town or Ferndale. No idle strolls around Blue Lake or down along the Mad River. No evening theater at Dell Arte. But Susan was content to miss all the touristy stuff. She'd been there, done that. She was hot to try her hand at backpacking. Back in Blue Lake I vigorously discharged my duties as Task Master. The first order of business was to select appropriate gear for Susan's backpack. We fitted her with Barbara's old Kelty external-frame pack, then began filling it with polypropylene underwear, rain gear, a pillow, flashlight, down jacket, and all the personal necessities. Susan would carry our old Sierra Designs Clip 3 tent, my old down sleeping bag, and some of the food. She would break in her brand new pair of trekking boots on the trail. Friday morning we arose with the dawn, tossed down a quick breakfast, and loaded our gear into the back of the van. Our destination was Deadfall Lakes. 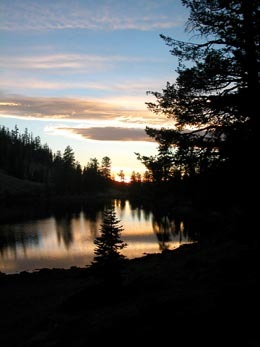 At the end of a relatively level three-mile section of the Pacific Crest Trail we would find plenty to see and do there. Our NOAA weather station, however, was not cooperating. Thunderstorms were forecast over the northern California mountains, precisely where we were heading. We drove east on Highway 299, with Barbara and I alternating driving and sitting in the folding chair wedged behind the front seats of the van. Susan rode shotgun to better take in the sights. At Weaverville we stopped at Topp's Supermarket for sandwiches and final provisions. To save time, we ate in the car as we motored north on Highway 3. As predicted, thunderheads materialized in the far distance, inconsequential in an otherwise cloudless blue sky, except that we were heading straight for them. At Parks Creek Road we turned right and followed the rocky wash of the Middle Fork of the Trinity River into the mountains, climbing directly toward the blackest of the thunderheads we had been watching for miles. This was the same road we had come down just four days earlier beneath blue and cloudless skies. Smoke from the Oregon fires no longer obscured the air. The single-lane blacktop crossed the Little Trinity on a concrete bridge, then wound up the Middle Fork to its junction with Deadfall Creek near the headwaters of the Trinity River. A mile or two further we arrived at lush Deadfall Meadow, 800 feet below the lakes. Above us lay the cirque holding the lakes, and above that towered Mount Eddy. The Eddies, at the easternmost extension of the Klamath Mountains, are a narrow range of sedimentary and metamorphic rock trending north and south between the Trinities and the Shasta Valley. Standing alone, 9025-foot Mount Eddy would be an imposing monument. Unfortunately, however, it is dwarfed by 14,162-foot Mount Shasta looming northeast across the valley. From Deadfall Meadow the old Sisson-Callahan trail climbs east past the lakes and over the southern shoulder of Mount Eddy before descending into the Shasta Valley. Our road, however, hair-pinned north and climbed to the ridge crest separating Trinity and Siskiyou Counties. Here it intercepted the Pacific Crest Trail at 6750 feet. We squirmed out of the van onto the parking lot, stretched our legs, and looked around. Mount Eddy wore a sombrero, as the Mexicans are fond of saying. But this was not the flimsy, wide-brimmed, wheat-straw bonnet of the arid Sonoran desert. No. Not at all. Before us towered a ragged buffalo-hide warrior headdress of an angry Indian shaman, festooned with crackling lightning and booming thunderclaps, black with torrents of rain underneath and ascending thousands of feet skyward. Our trail circled three miles southeastward, ending abruptly beneath the roiling black thunderstorm. A few wind-whipped raindrops torn from the storm tingled our skin. Yet above our heads the summer sky bore the clear blue of a washed marble. Floating in the blue around us towered the white billows of a half dozen other cumulonimbus like the tall sails of merchant ships plying a tranquil ocean. What to do? Camping that night at the trailhead was not a favored option. We could wait out the storm, or we could plunge into our hike and trust the monster to move out of our way. If we waited too long, the next storm, sailing in steadily from the west, might catch us on the trail. Chances were we could hike in and set up our tents before the next one hit. Hurriedly we performed the final loading and stowing, strapped on our backpacks, locked the van, and set our boots on the Pacific Crest Trail hiking south. The trail was a good one, contouring along the west and south slopes of a landscape of Martian red peridotite sparsely forested with incense cedar, ponderosa pine, and a few hardy red firs. Magnificent vistas open up across the Trinity River Canyon to the Trinity Alps crowned by granitic Bear Mountain, Sawtooth Ridge, and Thompson Peak. 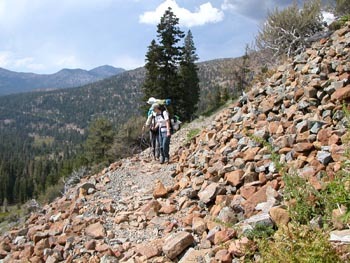 The trail rose imperceptibly and after a mile curved south as it entered a thickly forested slope of granitic scree and duff. Susan's backpack was heavier than we planned for her first trip, although not as heavy as ours. She endured increasing pain in her shoulders and neck, so we stopped in the forest shade to refit her pack. I set the shoulder straps closer together and jury-rigged a sternum strap. By tightening her belt to transfer more of the weight to her hips, Susan found the pack more comfortable, if not perfect. We pressed on. After two miles the trail emerged from the forest onto a precipitous exposed slope of sharp granite boulders and the climb steepened. Below us Deadfall Meadow opened out in a lush green sward. As we finally climbed into the cirque containing the lakes, the terrain again changed into the rough red ultramafic rock supporting a sparse growth of trees and shrubs. Our path dropped to a crossing of the northern fork of Deadfall Creek, and on the other side lay the junction with the Sisson-Callahan trail rising to meet us from Deadfall Meadow. From the junction we cross-countried to a boulder-strewn lateral moraine above the northwest shore of the large Middle Lake where we had camped before. The moraine runs east and west, dividing the drainage in two. South of the moraine the Middle Lake and the smaller Lower Lake populate a fracture line between granite to the south and peridotite to the north. 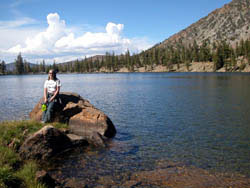 A white wall of granite talus rises above the Lower Lake with the southbound Pacific Crest Trail scratched through it. Water spills from the Middle Lake into the Lower Lake, then tumbles down a granitic lip toward Deadfall Meadow below. North of the moraine the Callahan-Sisson trail climbs along the northern fork of Deadfall Creek as it spills down from the Upper Lakes above. There on the rise between the Middle Lake and a grassy meadow we found our old campsite at the edge of a grove of mountain mahogany. A well-used fire pit had been built of large rocks stacked against a massive, sharp-edged slab of red boulder. The sun had disappeared and the sky threatened imminent rain. This campsite was high and dry and protected by the tall trees of a spare mixed conifer forest, so we dropped our packs against the pale hulk of a fallen tree and hurriedly made camp. The first order of business was to erect Susan's tent, then put up our own before the deluge hit. No time for backpacking lessons. While Susan stood clear, we deployed our familiar old blue tent with the quick precision of the Blue Angels jet fighter team. Still only a few sporadic splashes of rain descended, though the sky was growing ominously blacker. While Susan unloaded her sleeping bag, mat, and clothing into her tent, we set up our own tent in a clearing beside a small red fir Christmas tree. Miraculously, no serious rain fell before we managed to stow all our gear and cover our backpacks with tarps. It was still afternoon, but we decided to build a fire and cook supper while we could. As a light drizzle began to fall, we donned our ponchos. I modified the fire pit toaccept our grill while Susan and Barbara gathered dry sticks and twigs. The drizzle was not heavy enough to dampen the fire once we got it blazing. Susan sat on a rock and watched Barbara cook a freeze-dried dinner in our new oversized, three-person cook pot. Still the heavy rain held off, and the sky even seemed to lighten, as Susan had her first taste of freeze-dried, back-country fare. As usual, it was delicious after the long hike in. After dinner, the overcast continued to brighten. We scrubbed our dishes and explored the area. Patches of blue sky appeared and some late afternoon sunlight glanced through the humid air. We strolled down to the Lower Lake and returned as the sun set. That night it rained, heavy at times, but we slept snug and dry in our tents. Clear skies and a freshly-washed earth greeted us Friday morning. I strung up the hammocks, and Susan joined in our ritual morning coffee, tea, and silence. A few puffy clouds swam in the mostly blue sky. After breakfast, we again strolled down to the Lower Lake. Comfortable in a short-sleeved T-shirt, Susan sat on the black boulders exposed on the receded shore and watched a thousand tadpoles metamorphose into a horde of tiny hopping frogs. I was feeling tired, so we decided to take an easy stroll around the big lake we were camped on. In a wet bog at the marshy northeast corner we showed Susan a patch of carnivorous Darlingtonia, or California Pitcher Plant. We also encountered abundant wildflowers, including bright red paintbrush, blue gentian, daises with yellow centers and bright purple rays, vetch, and the lacy white heads of what we decided was cow parsnip. The meadow at the east end was dry and easily passable. No one was camped there or at the big campsite in the boulders at the southeast corner. From the steep south shore the views were impressive of Mount Eddy, with its signature white slash of vertically intruded granite. As we wandered through the flood plain at the west end of the lake, the wind rose. None of the campsites there were occupied. We had the lake all to ourselves. By the time we returned to our camp in the afternoon, the wind had become a steady, irritating nuisance blowing straight off the lake. By late afternoon, it was a gale, and we had to drop over the rise to the meadow to escape it. 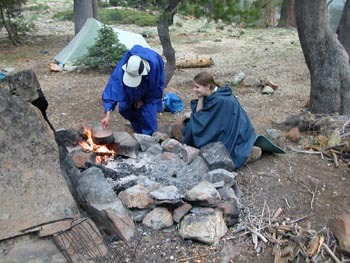 There we fired up our Sierra stove and cooked dinner in the lee of the moraine. We ate on our foam pads at the meadow's edge. Saturday morning I was still tired, but we decided to begin the 2000-foot climb toward the summit of Mount Eddy and see how far we got. We immediately merged into a long straggle of day-hikers attempting the peak. Someone had gone to a lot of trouble popularizing Mount Eddy in Sierra Club newsletters and catchy feature articles in the Sunday magazines of big-city newspapers far away. During our four-day stay we encountered three groups of ten or twelve middle-aged hikers with walking sticks and day packs, but few other backpackers. This was clearly not a trek for solitude seekers. We ascended the Sisson-Callahan trail as it wound up the moraine north of the lakes, finally cresting the ridge at a small lake where we had once camped years ago. The area was sparsely forested with lodgepole and rare foxtail pines. The path continued up into the cirque containing the Upper Lake directly beneath Mount Eddy. There the water was the lurid, startling, and inexplicable color of Pepto-Bismol. The Sisson-Callahan Trail curved around the lake and climbed the southern shoulder of Mount Eddy to meet a junction with the Mount Eddy trail before descending the far slope into the Shasta Valley and the City of Mount Shasta, formerly known as Sisson. The exposed slopes above the trail junction were thinly forested with stunted white bark and foxtail pines. The wind blew powerfully from the southwest. We climbed up the trail for a while, dropped over the rim of the cirque to escape the wind, and ate lunch gazing down on the Pepto-Bismol of the Upper Lake and the more plausible blue-green of the Middle and Lower Lakes beyond. After lunch, I felt tired. The glands in my throat were swollen. Uncharacteristically, I vacillated about whether we should climb the rest of the way to the summit in the blustery southwesterly wind. Susan and Barbara both wanted to press on. I considered waiting behind, but decided to keep going as far as I could. The straw hat on my head bent and twisted and blew off in the wind, so I tied it to my day pack. We all cinched our windbreakers tightly about our necks and leaned into the steady gale, pressing on one step after another up the barren, steep switchbacks toward the top. After ten-thousand small steps Susan finally led us over the crest of the treeless summit. Mount Shasta dominated the eastern horizon of the 360-degree vista. Susan was exuberant. A sense of accomplishment infused us. 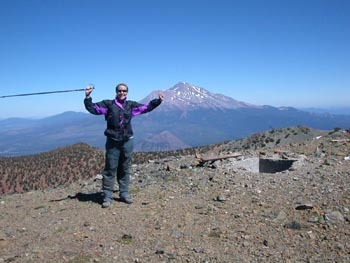 The gale was powerful and unrelenting, so we hunkered down just below the summit on the east and gazed at Mount Shasta. A few other day-hikers squatted out of sight below the rim to the north. The sky hung pure blue above with a froth of haze on the far northern horizon. The Cascades stretched from the hazy pyramid of Mount McLoughlin in the north to the residual snows of Mount Lassen in the south. Behind us, over the crest, lay the wilderness of the Trinity Alps, the Russians, and the Marble Mountain. We sat on top of the world. An unrepentant novice geologist, I began to point out the contrast between the smooth flowing terrain of the Cascade Range and the crinkled rough texture of the uplifted Klamath Mountains. No one payed much attention as I expounded on my embryonic hypothesis of the Jefferson Slip Fault, and soon my ramblings were totally lost and died out in the howl of the wind. An awe beyond words settled upon us. Time waits for no one. What goes up must come down. Enlightenment passes. Reluctantly we collected our things and began the long lugubrious trek back down to our campsite, the van, and the airplane that would carry Susan back to Chicago. We had attained a goal. So what? By the time we got back to camp the wind had died down and the afternoon sun was hot. We determined to try a quick dip in the lake. Generational values differ, so Barbara and I took a quick skinny-dip while Susan put on her bathing suit in her tent. We were securely wrapped in our towels by the time Susan came down and plunged into the cold water for a refreshing, albeit short, swim. The sun warmed and dried us. Our last evening was quiet. The wind had quit. After dinner we sat by the water and watched the sun set a golden red over the lower lake. We found our way back to camp in the gloaming. A new group camping at the end of our lake had built a blazing campfire that reflected picturesquely in the still waters. Sunday morning was cool, and we drank our tea and coffee by a blazing campfire. We took down our tents, gathered our things, loaded our packs, and hiked out. On the way, I posed a question, to get Susan's fresh perspective on the activity we loved. Why bother to backpack? None of us, alas, could articulate a satisfactory answer. Perhaps that is because the answer resides not in the head, but in the heart. When we were young, my brother George and I would be transported annually to Aunt Kate and Uncle Lloyd's house for Thanksgiving Dinner. At the banquet table our elders would pass the gravy and talk of creepy medical procedures, of what they had eaten for dinner last Wednesday, and of aunts and uncles and cousins with names like "John Brooks," "Candler," and "Cynthia and Elizabeth," who in my mind's eye were faceless constellations in a receding and irrelevant galaxy of kinship. Then we would nod off in an easy chair while a football game droned on the radio. I loved and respected my aunt and uncle, but I never really knew them. I hope this backpack trip with Susan has pierced that polite arms-length banality I learned to be normal. I hope it exposed Barbara, Susan, and me to an intimation of each other's humanity and visions. Not that I would have Susan follow in our footsteps. It is more than enough that she appreciates our love of the wilderness. Oh, and the swollen glands in my neck subsided over the ensuing weeks as my vigor returned. The best guess the doctor could offer was Cat Scratch Fever.